According to a DEP study 9.9% of all landfill waste is textile. The average American throws away 81 pounds of textiles each year. In Framingham alone, that means our city produces 2,265 pounds of textile waste each year. Yikes! Many people know that they can donate clothing in good condition to be resold at charity thrift stores, but what about ripped jeans, holy socks, faded curtains? 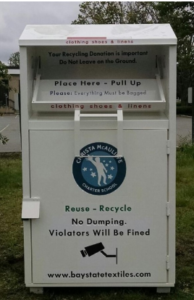 Donate your unwanted textiles to McAuliffe via the Baystate Textiles bin located at the corner of our parking lot. Baystate Textiles accepts ALL clean and dry textiles in any condition. This includes clothing, linens, shoes, and stuffed animals. 95% of donated textiles can be reused: 45% ends up being resold, 20% is shredded and converted into other materials, and 30% is turned into industrial rags. By donating used textiles to the bin at McAuliffe you keep these items out of the landfill. Click here to view the flyer that lists all of the items that are accepted via the Baystate Textile bin.